Alejandro Arana, age 94, of Orlando, Florida passed away on Monday, January 28, 2019. Alejandro was born on February 26, 1924 in Loiza, Puerto Rico; son of the late Luis Arana Walker and Anastacia (Lopez) Walker. He was a veteran of the United States Army, honorably serving his country from 1943 to 1945. After his discharge from the military, he worked as a merchant marine before his retirement. Alejandro was a master of all trades, you can always find him fixing and building many things. He loved working with tools and collecting anything that caught his eyes. 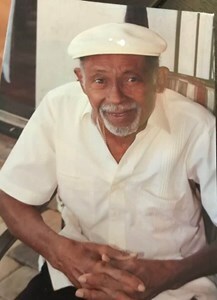 Alejandro is survived by a son, Robert Arana and his wife, Rosa; four daughters, Awilda Garcia, Alejandrina "Margie" Mendez and her husband, Tony, Miriam Bryant and her husband, George, and Eloise Arana-Matos and her husband, Manny; eighteen grandchildren, Leticia Pabellon, Cindy Pabellon, Michael Algrain, Jessica Algrain, Ruben Algrain, Gilbert Mendez, Sandy Santiago, Jeanette Salcedo, Joseph Arana, Emily Arana, Anthony Arana, Ivan Arana, Sean Jennings, Maria Alejandra Persad, Samantha Matos, Nicole Torres, Anthony Delannoy, Selena Ramirez, Giovanni Ramirez, and Jimmy Ramirez; two step-daughters, Virginia Delannoy and Mary Ramirez; sixteen great-grandchildren; and twelve great-great grandchildren. After the passing of his wife Margarita, he met Eloise Andino, who he would spend the next fifteen years raising their daughter who was also named Eloise, and his step-kids Carmen, Virginia, Wilfredo and Mary. Finally after Eloise, Alejandro would meet the woman he would spend the next forty years of his life with, Maria Pizzaro, who had two children, Cloty and Henry, four grandchildren Jose, Stephanie, Melissa and Maria, and five great-grandchildren. He was preceded in death by his parents; his wife, Margarita Arana; two sons, Jose Arana and Alexander Arana; and a daughter, Estelle Arana. A Funeral Service will be celebrated on Tuesday, February 5, 2019 at 12:00 Noon, at Newcomer Funeral Home – East Orlando Chapel, 895 S. Goldenrod Rd, Orlando, FL 32822. Visitation is Monday, February 4, 2019 from 6:00 pm to 9:00 pm at the funeral home. Burial with full military honors will be on Tuesday, February 5, 2019 at 2:00 pm at Cape Canaveral National Cemetery, Mims, FL. To share your memories of Alejandro or leave a special condolence message for his family, please click the Share Memories button above. Add your memories to the guest book of Alejandro Arana. Thank you for your LOVE. Although I was not close I always prayed that God would watch over you/keep you safe and he did to the end. I have kept you in my heart all my life and that is where I will keep you forever. Rest in peace until we meet again. Your witty sense of humor and dance moves will be missed! We love you! Kiss daddy for us! My Sincere Condolences To His Children,His Grandchildren and Great Grandchildren. May You All Gain Strengtht at this difficult time, and Know That He is now with His Maker the Lord. To All My Heartfelt Sympathy. May Mr. Alejandro Arana Rest In Eternal Peace.